Greek cuisine has a culinary tradition of some 4,000 years and is a part of the history and the culture of Greece. Its flavors change with the season and its geography. Greek cookery, historically a forerunner of Western cuisine, spread its culinary influence - via ancient Rome - throughout Europe and beyond. It has influences from the different people's cuisine the Greeks have interacted with over the centuries, as evidenced by several types of sweets and cooked foods. It was Archestratos in 320 B.C. who wrote the first cookbook in history. Ancient Greek cuisine was characterized by its frugality and was founded on the "Mediterranean triad": wheat, olive oil, and wine, with meat being rarely eaten and fish being more common. This trend in Greek diet continued in Roman and Ottoman times and changed only fairly recently when technological progress has made meat more available. Wine and olive oil have always been a central part of it and the spread of grapes and olive trees in the Mediterranean and further afield is correlated with Greek colonization. The Byzantine cuisine was similar to the classical cuisine including however new ingredients that were not available before, like caviar, nutmeg and lemons, basil, with fish continuing to be an integral part of the diet. Culinary advice was influenced by the theory of humors, first put forth by the ancient Greek doctor Claudius Aelius Galenus. Byzantine cuisine benefited from Constantinople’s position as a global hub of the spice trade. The most characteristic and ancient element of Greek cuisine is olive oil, which is used in most dishes. 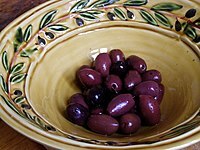 It is produced from the olive trees prominent throughout the region, and adds to the distinctive taste of Greek food; however, they are also widely eaten. The basic grain in Greece is wheat, though barley is also grown. Important vegetables include tomato, aubergine (eggplant), potato, green beans, okra, green peppers, and onions. Honey in Greece is mainly honey from the nectar of fruit trees and citrus trees: lemon, orange, bigarade (bitter orange) trees, thyme honey, and pine honey. Mastic (aromatic, ivory coloured resin) is grown on the Aegean island of Chios. Greek cuisine uses some flavorings more often than other Mediterranean cuisines do, namely: oregano, mint, garlic, onion, dill and bay laurel leaves. Other common herbs and spices include basil, thyme and fennel seed. Parsley is also used as a garnish on some dishes. Many Greek recipes, especially in the northern parts of the country, use "sweet" spices in combination with meat, for example cinnamon, whole spice and cloves in stews. The climate and terrain has tended to favour the breeding of goats and sheep over cattle, and thus beef dishes are uncommon. Fish dishes are common in coastal regions and on the islands. A great variety of cheese types are used in Greek cuisine, including Feta, Kasseri, Kefalotyri, Graviera, Anthotyros, Manouri, Metsovone, Ladotyri (cheese with olive oil), Kalathaki (a specialty from the island of Limnos), Katiki-Tsalafouti (both creamy cheeses, suitable for spreads) and Mizithra. Too much refinement is generally considered to be against the hearty spirit of the Greek cuisine, though recent trends among Greek culinary circles tend to favour a somewhat more refined approach. Dining out is common in Greece, and has been for quite some time. The Taverna and Estiatorio are widespread, serving home cooking at affordable prices to both locals and tourists. Recently, fast food has become more widespread, with local chains such as Goody's springing up, though most McDonald's have closed. Locals still largely eat Greek cuisine. In addition, some traditional Greek foods, especially souvlaki, gyros, pita such as tyropita and spanakopita (respectively, cheese and spinach pie) are often served in fast food style. Greece has an ancient culinary tradition dating back several millennia, and over the centuries Greek cuisine has evolved and absorbed numerous influences and influenced many cuisines itself. Some dishes can be traced back to ancient Greece: lentil soup, fasolada, retsina (white or rosé wine flavored with pine resin) and pasteli (candy bar with sesame seeds baked with honey); some to the Hellenistic and Roman periods: loukaniko (dried pork sausage); and Byzantium: feta cheese, avgotaraho (cured fish roe) and paximadi (traditional hard bread baked from corn, barley and rye). There are also many ancient and Byzantine dishes which are no longer consumed: porridge as the main staple, fish sauce, and salt water mixed into wine. Many dishes are part of the larger tradition of Greek cuisine: moussaka, tzatziki, yuvarlakia, keftethes, boureki, and so on. Greek cuisine is very diverse and although there are many common characteristics amongst the culinary traditions of different regions within the country, there are also many differences, making it difficult to present a full list of representative dishes. For example, the vegetarian dish "Chaniotiko Boureki" (oven baked slices of potatoes with zucchini, myzithra cheese and mint) is a typical dish in western Crete, in the region of Chania. 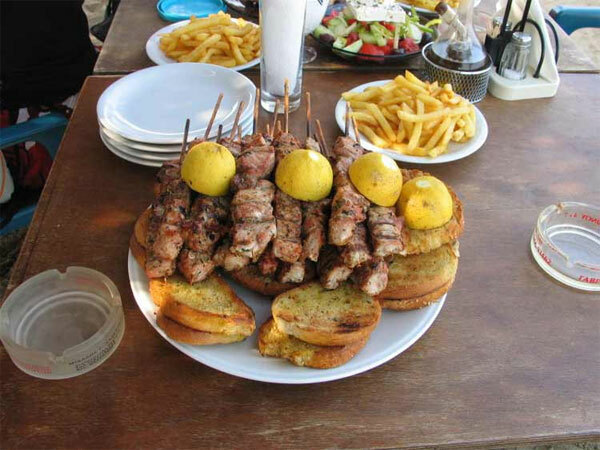 A family in Chania may consume this dish 1-2 times per week in the summer season. 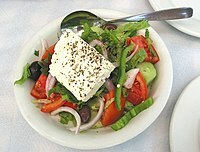 However, it is not cooked in any other region of Greece. Many food items are wrapped in Filo pastry, either in bite-size triangles or in large sheets: kotopita (chicken pie), spanakotyropita (spinach and cheese pie), chortopita (greens pie), kreatopita (meat pie, using minced meat), kolokythopita (zucchini pie) etc. 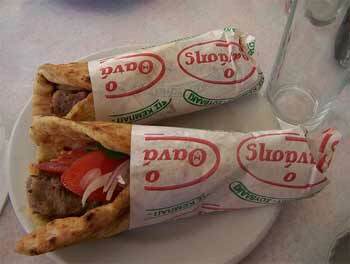 The Greeks do with filo what the Italians do with pizza; They have countless variations of pitas (savory pies). Even the word pita was originally spelled πίττα (pitta), which shows a similarity to pizza. The areas with the largest tradition of making Greek pitas are the North-Western (Hepirus) and Central Greece (also called Roumeli). Also, a big part of the Greek Cuisine are seeds and nuts. Seeds and nuts are included in everything from pastry to main dishes. 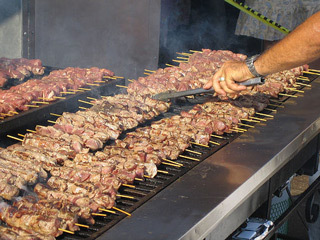 Souvlaki is a well known treat in Greece. Greeks eat souvlakia all the time either hastily on the streets while they move on to reach their destination or sitting at the table of a souvlatzidiko, the restaurant which sells souvlakia. Souvlaki is rather cheap, you can by a souvlaki with pita bread for about two euros and a souvlaki on a skewer without the pita accompanied with some bread for about a euro and a half. 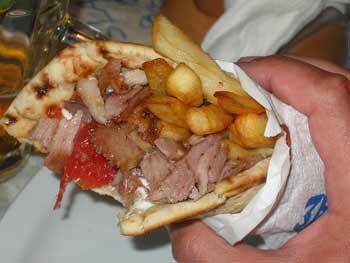 The souvlaki is usually made from pork pieces of meat and gyros but you can also find one with chicken or a kebab. The pita bread souvlakia contain, apart from the meat, fresh tomatoes and onions, French fries which are optional and tzatziki. Tzatziki is a very special delicious Greek sauce with yogurt, garlic, olive oil, cucumber and a bit of vinegar. The pita is oiled and then grilled before being used to wrap all the ingredients. If you do not like the onion you can ask them to prepare a souvlaki without it. Generally any ingredient can be omitted but the taste is not the same and believe me all the ingredients add up to a unique tasty result. 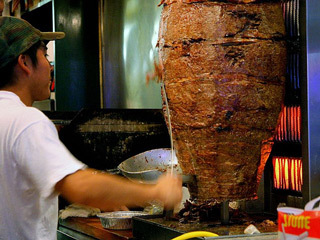 Now as far as gyros is concerned it is an upright spit stacked with thin slices of pork that rotates slowly in front of some electric bars. The heat melts the fat, which drips from the bottom end of the spit and the fat cone of meat becomes nicely brown and crunchy as it turns. When it is ready they slice it and put it inside the souvlaki. Some people like to omit the tzatziki and use ketchup or mustard instead. Don't do it! This ruins all the taste and it is definitely not how a Greek souvlaki tastes like. If you do not like souvlakia just order a hot dog! Kali Orexi - Good appetite - Bon appetite!